The tyrant Balthazar (habitual nasty Spaghetti Western , Folco Lulli), usurper of Babylone , rules the city with violence and atrocities . He organizes continuous sacrifices of maids along with the priestess (Moira Orfei , Peplum usual , along with her sister Liana Orfei) of Astarte . Nippur (Gordon Scott , here one of the few movies to show him with chest hair) , legitimate heir of throne , returns from exile with aim to retrieve the kingdom left by his father Sargon , kidnapped by Balthazar . During his journey , Nippur frees Tamira (Genevieve Grad ), a Jewish girl prepared to be sacrificed for Goddess Ishtar . Nippur is imprisoned by the usurper , but he escapes and is helped by king Persian Cyrus (Mario Petri). This is an agreeable Sword and Sandals movie with noisy action , extraordinary adventures , usual dancing scenes and spectacular final battle . 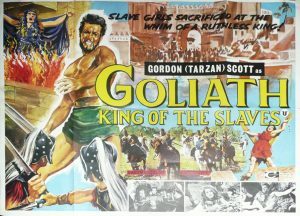 Gordon Scott is nice as the mythical hero who finds several dangerous situations while attempting save his lover and recover the throne . He acted as a bouncing hero in great number of films and was randomly assigned the identity of Hércules , Goliath , Samsom for US viewers . Scott usually playing historic characters , such as ¨Coroliano¨, ¨Mucius Scevola¨ and ¨Remo¨. He was one along with Ed Fury, Dan Vadis, Alain Steel , Mark Forest, Reg Park , among others, whom the seek fame and fortune acting absurdly muscle mythological figures, but nobody topped Steve Reeves and Gordon Scott in popularity. The film follows a similar plot to famous film ¨Intolerance¨ (1916) by D.W. Griffith , about fall of Babylone , though here appears a pretty malicious Balthazar , well played by Folco Lulli , but not the biblical history about ‘prophet Daniel and the lions’ . However , the movie has not mythological accuracy , neither expecting historical . Other pictures about these Babylonic events are the followings : ¨I Semiramide (1953)¨ by Primo Zeglio with Ivonne Furneaux and John Erickson ; ¨Semiramis, slave and Queen¨ by Carlo Ludovico Bragaglia ; and ¨Seven thunderbolts(1962)¨ by Silvio Amadio with Jackie Lane and Howard Duff .